This product is discontinued and replaced by Bus Blaster v4. Bus Blaster v2 is an experimental, high-speed JTAG debugger from Dangerous Prototypes. Thanks to a reprogrammable buffer, a simple update over USB makes Bus Blaster v2 compatible with many different JTAG debugger types in the most popular open source software. Each unit is tested with a real JTAG target before it ships. 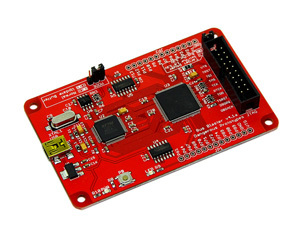 This open source hardware and software is distributed in the hope that it will be useful, but WITHOUT ANY WARRANTY; without even the implied warranty of MERCHANTABILITY or FITNESS FOR A PARTICULAR PURPOSE.